Our next book has safely gone to the printers, so it's about time we told you a bit more about it! Something New to Learn About Lace is the second book in our Something New to Learn series – small books to help you to grow your knitting skills, accompanied by detailed photo tutorials, video tutorials online, as well as beautiful knitting patterns. We launched Something New to Learn About Cables back in March, and it's been brilliant to see so many knitters joining in with the cables knitalong in our Ravelry group and generally getting enthusiastic about cabled knits! We intend for this series to cover each subject in some depth, without becoming indigestible, and for each book to be the perfect size to throw in your project bag along with your work in progress. There is a third title planned for the autumn and after that, I have more ideas floating around than I really know what to do with! Something New to Learn About Lace is now available to pre-order (this allows us to more efficiently handle large volumes of orders since it's just Jim and I to pack and ship everything!). The print book comes with a free ebook download and costs £14.00 plus shipping, or you can purchase the ebook only edition which costs £13.99. Kits are available to accompany each pattern in the book. All of the patterns use our Something to Knit With 4ply yarn, and we have yarn kits set up to accompany each pattern. 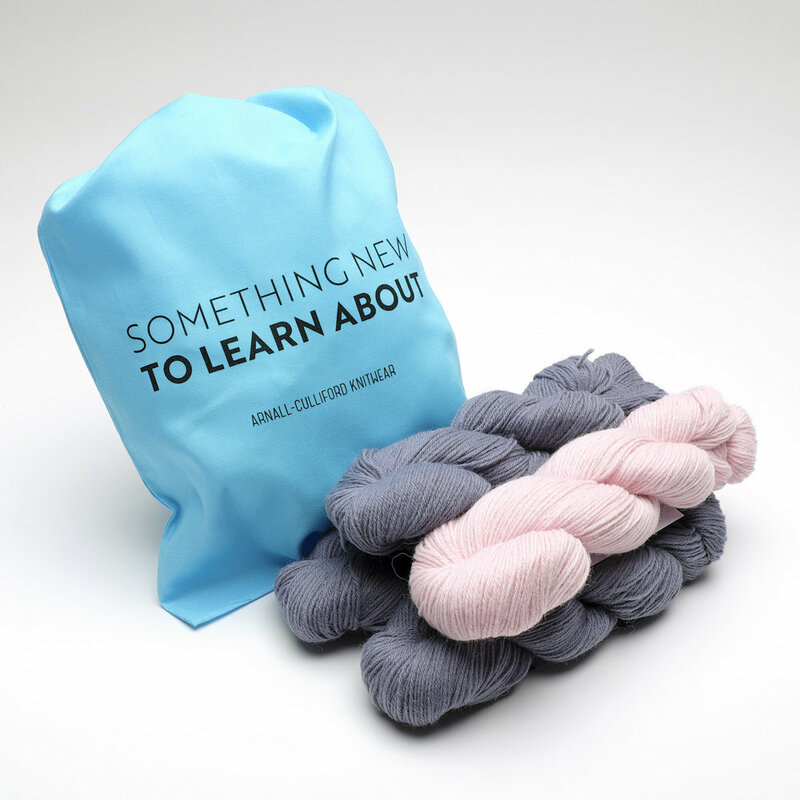 The kits allow us to offer you a small discount on the cost of the yarn when you purchase from us, and each kit comes with a handy Something New to Learn project bag. Kits start at £22.50 plus shipping. We have also stocked the shop with lots of handy accessories for lace knitting, including lace blocking wires, blocking mats, T-pins, knit blockers (pin combs) and stitch markers. And if you are new (or new-ish) to lace knitting we have set up a bumper Lace Accessories Bundle that gives you a brilliant starter set, and would make a fantastic gift. I'm really excited to start revealing the gorgeous designs... My co-designers, Donna Smith and Martina Behm really knocked their patterns out of the park, and I hope you will like mine too! Over the next 10 days we will be revealing the beautiful photos of the patterns in this book (I know! We are a terrible tease! ), but in the meantime, if you want to do some sleuthing, you can read a bit more about each of the designs over on the kit pages in our shop, or on the Ravelry pattern pages. Lace knitting is one of my favourite types of knitting – particularly in the summer months, when it's good to have a more lightweight project on your needles. I love the rhythm of the stitches, and I hope you'll find my hints and tips on avoiding and fixing mistakes really helpful, along with all the other tutorials in the book. We will be holding a lace knitalong in our Ravelry group through July and August, so there's some time to get your patterns sorted and needles freed up before the fun commences. 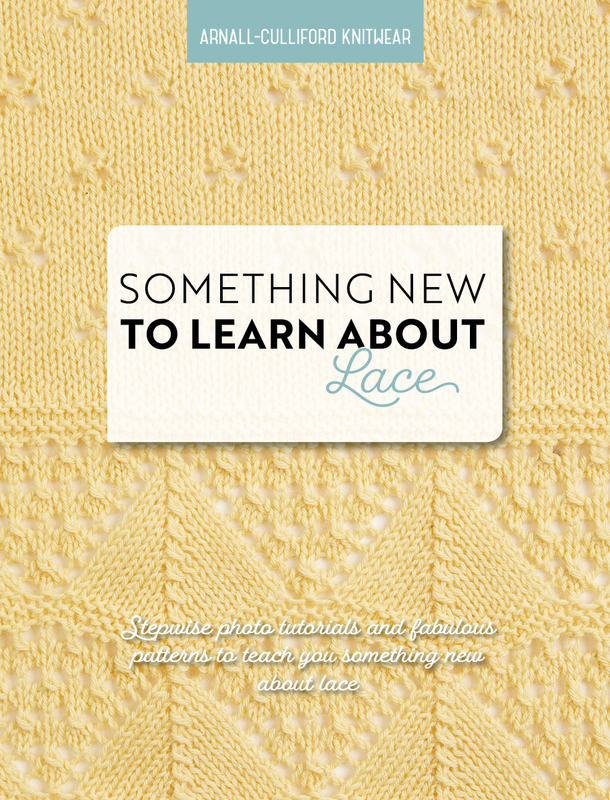 Orders containing print copies of Something New to Learn About Lace will be shipped by Thursday 7th June. If you purchase an ebook, it will initially contain just a welcome PDF, and the complete ebook will be uploaded by Wednesday 6th June to coincide with shipping of the print copies. Something New to Learn About Lace is doubly exciting for us, since it's the first set of patterns in our new yarn. Massive thanks are due to Donna Smith and Martina Behm for creating wonderful designs for us, and we are really looking forward to seeing your projects! Finally, if you are a local yarn shop and would like to stock copies of Something New to Learn About Lace, they will be available from August 2018, and you can place a preorder through our Contact Us form.